Born in 1926, Al Cooper created the characters “Capt. Red Thortan”, “Clift Steele”, “Scotty MacDonald” and “The Young Commandos” while at Bell Features & Publishing in the 1940’s. He was particularly good at drawing machinery: aircraft, tanks etc. By Active Comics 13, early 1944, Al was with the R.C.A.F. at Uplands Station in Ottawa, doing victory bond posters. Although in Active 13, Bell was confident that Al would be able to continue the “Clift Steele”, “Red Thorton” and “Scotty MacDonald, in Joke 23, we find this was not possible. Bell predicted that with the war ending Art would be back, but the company ceased operations before that happened. A few years later, he became a partner and creative director at Maple Leaf Press in Toronto. In 1963, he started his own company called Cooper Graphics and Associates in Thornhill Ontario. In community work, he was president of the Downsview Lodge of the B’nai B’rith and worked on developing their newspaper The Covenant. He was involved with the Herbie Foundation at the Hospital for Sick Children. He died of a heart ailment at the Toronto General Hospital 7 January 1986. “American Bombers of the Three Wheeled Type.” Active Comics, 18, no date: 30. “Battle Tactics.” Active Comics, 5, no date: Inside front cover. “Communication Aeroplanes.” Active Comics, 8, no date: 15. “Crack U.S. Fighters.” Active Comics, 8, no date: 12. “Fighting Aircraft.” Active Comics, 6, no date: 31. “Flying Tigers.” Active Comics, 7 no date: Inside front cover. “Paratroopers.” Active Comics, 6, no date: 16..
“Tanks.” Active Comics, 6, no date: 63. “Torpedo Aircraft.” Active Comics, 13, no date: 18-19. 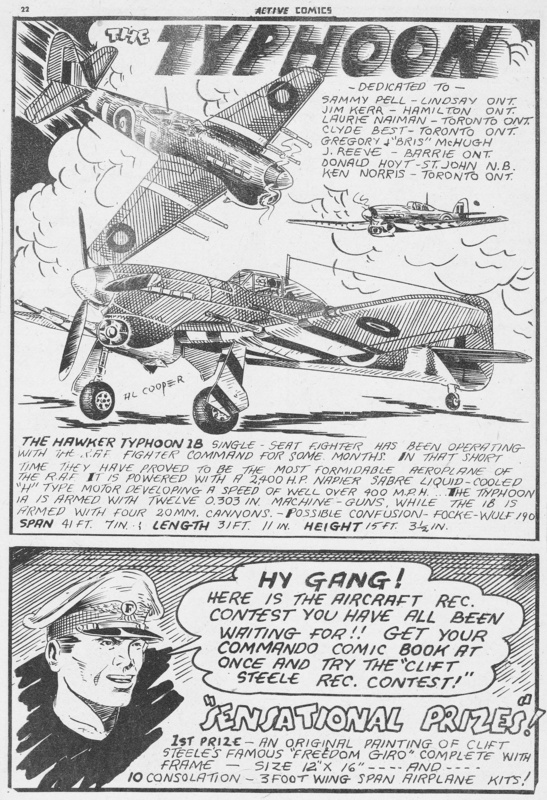 “The Typhoon.” Active Comics, 12, no date: 22. 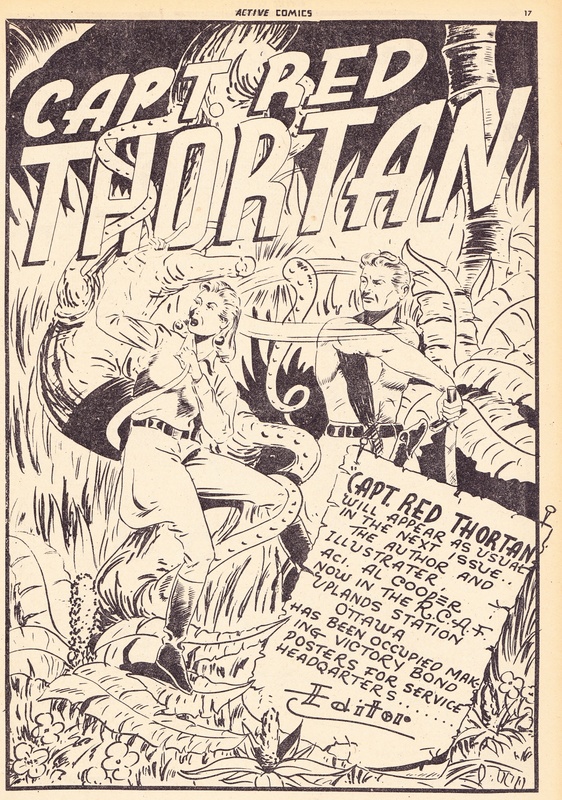 “Captain Red Thortan.”. Active Comics. No date after issues 1 & 2. 5: 38-49. \ 6: 36-47. “Capt. Red Thortan.” Car., unidentified. probably Al Cooper. Active Comics, no date. “Capt. Red Thortan.” Active Comics. No date. “Kenneth Scotty McDonald.” Dime Comics, 1-1, Feb. 1942: 44-64. “Scotty McDonald.” Dime Comics, no date. 1-3: 48-64. 6: 52-63. 9: 53-64. 10: 53-63. 13: 47-55 17: 18-23. 18: 18-23. Front: “Capt. Red Thortan.” Active Comics,12, no date..
“Welcome Home Gang.” Joke Comics. 23, no date: 27..
“Albert (Al) Cooper, 60 drew Canadian comics.” Obituary. Toronto Star, 9 January 1986. Bell kept its readers informed about the artists. Illus., Al Cooper, Active Comics, 13: 17. I just found this site, it’s a very cool, and interesting thing you’re doing. It sounds like he could have passed away during the war, and that wasn’t the case according to his obit in The Toronto Star. It looks like he had quite the career in the printing industry later on. I’m just taking over the web site from Scott and hope to install the rest of it in the next few months. Please bear with me though. There are 1800 + entries to go. I opened this site that I might fill in my own gaps in information, and so I welcome comments. As you can see I list sources for my information and so I would like any information sent to have a source whether it be personal experience or an identified source such as you offered. Thanks for your kind comments and your information on Al.